We should wait until tomorrow to see the final result. It is the actual counting but it's not fully completed by now. Anyway, it seems to be about 60%. Is it exit poll announcement or actual counting ? Putin has won with about 60% of votes. Thank you Natalia give me feedback from time to time. Yesterday I sent only a short opinion of mine. I'd like to add that your predictions, especially about Russia and the Russian leadership, have always been highly appreciated by Russians and Russian astrologers whom I know. And here you give two important horoscopes, rectified by you, and they have different times than those used by others. I think, the article and the predictions, the new ones as well as the old one are of great interest. Could you, please, excuse the imperfections of my style. Coming to Putin, let me show step by step why and how I corrected the horoscope of Putin and changed it completely from what Rodden has given. I do not know how Astrotheme gets Scorpio ascendant on the basis of 9/30 am. Rodden Rating C is commendable for its sterling honesty and when it is C you know that it subject to intense verification and correction. Some Russians gave me time ranging from 10/30 to 2 pm even. I assured them that I would the correct and give predictions on the basis of my rectified one, as I have done many times now. But I took some life events of Putin and came to the conclusion that it had to be 14/21 or twenty six degrees and fifty two minutes, or the last navamsha of Vrischika to fit into the known facts of his life, or those facts which are known and not disputed. First see that he is the only surviving son of his parents. Read the excellent research in the book of Rajbir Singh The Only Child, guided by me to understand the logic. Rahu in the third house and two malefics in the eleventh. And it has to repeat in the dreshkona. Those who do not use divisional charts live in a primitive age and ignore Parashara. However controversial that compilation may be yet it is still the best ever book on astrology ever produced in the world. Saturn-Sun from 17 Dec 2011 to 28 Dec 2012. Elections will be in Rahu pratyantara dasha on 4 March 2012. Now see education, again Parashara, and examine the fifth house and the fifth lord not fourth house and the fourth lord. Long ago I wrote in the Astrological Magazine of Dr. Raman that fifth house for education as north Indian astrologers take, and the ninth house for father as south Indian astrologers take is what I employ successfully. It is a modern research and read the super excellent book of Naval Singh “Planets and Education” based on my evolved parameters for modern subjects not given in a single astrological book of ancient or medieval India. Jupiter, the fifth lord of education in law, is in the sixth house of disputes (courts) and the lord of dispute Mars aspects the fifth house and Saturn the planet for the cause and agony of disputes also aspects the fifth house. Jupiter, Saturn and Mars have to combine in some ways to influence the pattern of education in law--meaning a certified course in law not mere knowledge of law without a degree or diploma. Once you have verified the facts about siblings and education you can proceed to verify other facts and see if they fit into the pattern of Vimshottari dasha and my version of Chara dasha in which I use karakas (incidentally, in Jaimini astrology no one used karakas ever till I did a research and produced it and therefore those who talk of charakarak substitution are deceiving first themselves and then the students of Jaimini astrology and inventing a fiction which has no basis in any book and commentary of Jaimini. Then again use seven and only seven karakas otherwise the seventh karaka, spouse, will become Gnathikaraka or enemy (unless you want to call your spouse your enemy). In the Swamsha( navamsha of all karakas), Putrakaraka, (see for also for education) is Moon in the rashi of Mars and is aspected by (Jaimini aspects) Jupiter and Saturn while Mars (the Gnathikaraka) is aspecting the fifth house. In the Swansha, from Karakamsha, the third house is aspected by AmK and Mars the Gnathikaraka, here meaning martial arts, and Putin is well known for his skill in sambo and judo. He married on 20 July 1983, in Rahu Moon Moon in Vimshottari dasha and Moon is in the seventh house, and Kanya-Kanya (Virgo-Virgo) in Chara dasha which is the seventh house of navamsha and has darapada in the seventh house from here. 28.04.1985 - the first daughter, Mariya, was born. Rahu Mars. Mars aspects the fifth house both in the birth horoscope and the saptamsha. In Chara dasha it was Simha Tula (Leo-Virgo) Simha is apected by the natural putrakaraka, Jupiter, and the fifth house is aspected by Jaimini Putrakaraka, Moon. 31.08.1986 - the second daughter, Ekaterina, was born in Jupiter-Jupiter. Jupiter is the fifth lord both in the birth horoscope and the Saptamsha. In Chara dasha it was Simha-Dhanu and from Dhanu Jupiter is in the fifth house. In the Swamsha, from Karakamsha, (Jupiter in Vrischika), Saturn in the tenth house makes him the world famous personality that he is. 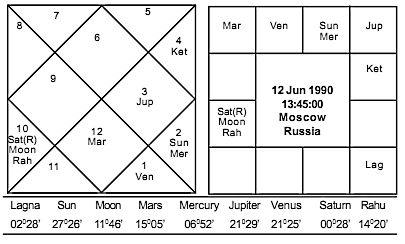 From 1996 to 2000 in the Chara dasha of Mithuna (Gemini) with Amatyakaraka, Saturn aspecting the tenth house, he got into the good books of Boris Yeltsin and succeeded him after becoming his prime minister. In the dasha of Mesha (Aries) from where the Amatyakarak is in the sixth house aspected by Gnathikaraka, Mars, his enemies did a vicious propaganda against him and in the antardasha of Kumbha (Aquarius) from where AmK falls in the eighth house even carried on a malicious campaign against him. The elections would be, it was announced, on 4 March 2012 when the pratyantara or sub-sub-period would be Tula (Libra) from where the AmK, GK and BK would be aspecting the sixth house while in Swamsha, the AmK goes into the eleventh house of gains. In Vimshottari it would be the period of Saturn and Sun both in the eleventh house, the Sun sub period following the enigmatic Saturn Venus period of all that malicious campaign against him , may have been inspired by ---well which country? Now use the Dashamansha ( do not remain confined to primitive tools of predictions) and see Saturn in the eleventh house with Mars, the ninth lord of luck and dignity and if you like, presidency, exalted, and Sun the royal planet, owning the sixth house in the dashamansha, is in the ninth house again of dignity. Is the importance of Dashamansha as stressed by Parashara to be used or not in the case of those who are the achievers of our society, nation or the world ? You are a modern astrologer and doing modern astrology based on astrological classics( written in agricultural, pastoral times) which you must refuse to accept blindly as dogmatic rules. When you are doing astrology you are only an honest astrologer true to your experience and research, if you have done any. NEW DELHI: As Prime Minister Manmohan Singh's theory of 'foreign hand' in protests against the Kudankulam power plant started sparking off a controversy, Union minister V Narayanaswamy came to his defense saying the contention was based on a home ministry probe. The Kudankulam power plant, if you, know is a Russian baby. Expect followers of Gennady Zyuganov of the Communist Party and Gennady Zyuganov himself to call the elections a fraud after his fifth defeat in presidential elections of post USSR period and the present elections.